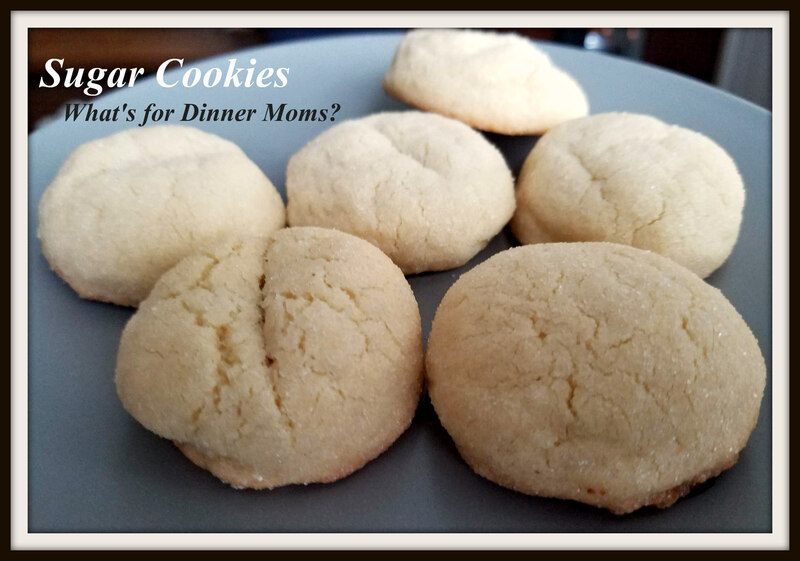 Chewy Sugar Cookies – What's for Dinner Moms? Can you believe we are into August already? It is unbelievable that the summer has flown by. I noticed the other night that the sun is starting to set a bit earlier and nights have been a bit cooler. In fact until the other day the temperature has been in the low 70s and high 60s during the day so it almost had a fall feel in the air. It was starting to make me a bit sad (I always have a case of the blues around Labor Day and the start of school.) But, I then realized I still have 5 more weeks until the kids go back to school so we are going to celebrate! Yes, we had ice cream for dinner. But, I also wanted something to have on hand for the next few days to snack on so my daughter kindly made cookies. I love cookies probably more than just about any other dessert. But, I am picky about my cookies. I like a great flavor and a nice chewy cookie. It doesn’t need to necessarily have lots of chunks and stuff mixed into it. In fact I actually prefer a really good plain cookie and this is perfect for me. This cookie has a bit of a crisper outer shell and a nice soft center. Be very careful not to over bake these cookies or they will be too hard. The centers are super soft and they brown up quickly so you want them just browned on the bottom. A nice cold glass of milk and a few of these cookies are a perfect after school snack or pick me up at the end of the day. In a large bowl, beat the butter, oil and sugars. Beat in eggs until well blended. Beat in vanilla extract. Combine the flour, baking soda and cream of tartar; gradually add to creamed mixture stirring until well combined. Drop by small rounded teaspoonfuls onto ungreased baking sheets. Bake until lightly browned, 8-10 minutes. Remove to wire racks immediately to cool. Definitely a perfect snack! Thank you, Marci! I like cookies too, Marci, and these sound delicious. Oh, Monday would break my heart! I love having my kids around and think 4 more weeks is too short. A number of schools are trying year round school here this year. Thankfully, not ours. I think I’ll try these 😉. And I have to tell you the title picture on your blog is making me hungry! Awe, thank you! I hope you like them! They look excellent. I know what you mean about sadness and the passing of the year. I’m feeling it more this year than in previous years. Thank you. I am trying to find the good things and to celebrate the passing of time rather than mourn it. You made a good start with Chewy Sugar Cookies. Even the name sounds happy. Looks perfect to go with a coffee!